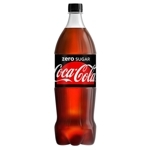 Free 500ml bottle of Coca Cola Zero sugar. Just enter your details and you be sent a voucher by either email or text which will then be valid for 2 weeks from the time it is issued. You can then redeem it at partisipating Asda stores for a free 500ml bottle of Coca Cola Zero Sugar. You must request your free voucher by 25th September 2016.